Too much good news from the United States is bad for the yuan. Markets have priced in one rate hike by the Federal Reserve, but positive surprises leading to more increases will undermine China’s gradual depreciation of its currency. That could force regulators to tighten up capital controls. Careful management of the exchange rate by the People’s Bank of China has won reluctant plaudits from investors who predicted a sharper crash as the country’s currency reserves dwindled in late 2015. Some more excitable observers pointed out that if 60 million citizens bought their permitted $50,000 annual quota of foreign exchange, the country’s $3 trillion-plus coffer would be almost empty. Chinese people did no such thing. The dollar stopped rising after the Fed delayed an expected summer rate hike. Meanwhile, judicious intervention by the PBOC to squash speculators stabilized the currency. Now positive news from the world’s largest economy is pushing the dollar up again. 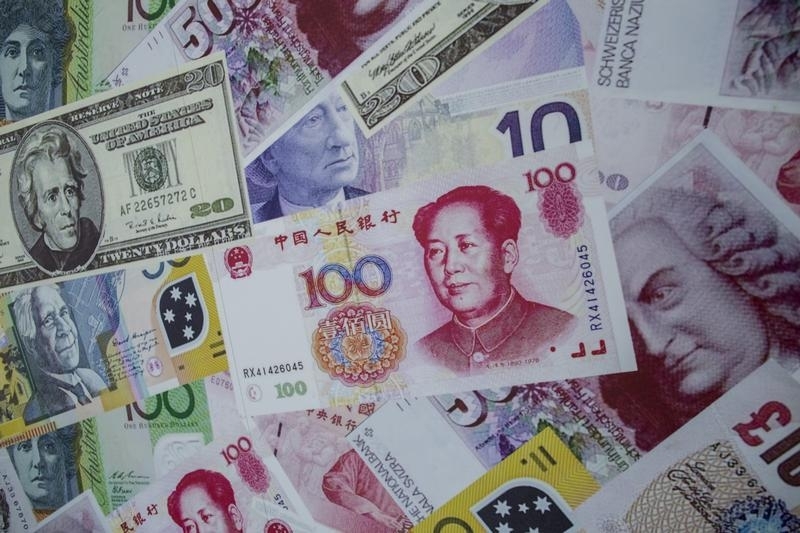 A broad-based index of the greenback’s value rose over 3 percent from a trough in mid-August; the onshore yuan has fallen to 6.7 per dollar, its softest since 2010. The country’s massive forex reserves lost $45.7 billion in October, more than the three previous months’ combined drain. Speculators took notice. A Reuters survey in October showed bearish bets against the yuan at a ten-month high. Net sales of foreign exchange by Chinese commercial banks tripled to $28.4 billion in September from the previous month, implying rising appetite for hard currency among Chinese companies. Those firms are back to borrowing dollars: dollar-denominated claims on borrowers stood at $367 billion at the end of the second quarter, up from $330 billion three months earlier, according to the Bank for International Settlements. 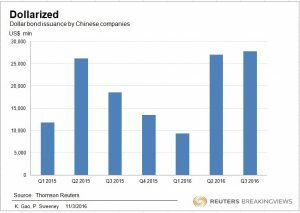 A Thomson Reuters analysis showed Chinese companies also ratcheted up dollar bond issuance, issuing $27 billion in the third quarter, the highest since the fourth quarter of 2014. 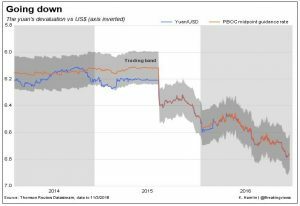 An accelerated dollar rally could prompt a rush to refinance this debt onshore – the very phenomenon responsible for the sharp rundown of China’s reserves in 2015. It is politically unacceptable for Chinese officials to let the currency drop too sharply. The alternative is buttoning the capital account back up. Regulators can easily slow or halt approvals for outbound investments, while threatening to prosecute “malicious” speculators. Signs of a crackdown are already on display in Hong Kong. If the U.S. economy keeps strengthening, there’s more to come. The U.S. Commerce Department announced Oct. 31 that the economy grew at its fastest pace in two years in the third quarter. Gross domestic product increased at a 2.9 percent annual rate after rising at a 1.4 percent pace in the second quarter. U.S. employers maintained a strong pace of hiring in October and boosted wages. Nonfarm payrolls increased by 161,000 jobs last month amid gains in construction, healthcare and professional and business services. The yuan depreciated by 1.5 percent against the U.S. dollar in October, falling to 6.77 per dollar in its worst month since August 2015. China's foreign exchange reserves missed expectations in October, falling to $3.12 trillion, the central bank said in a statement on Nov. 7, their sharpest drop since January and their lowest level since March 2011. China has intensified a crackdown on the sale of Hong Kong insurance products to mainland Chinese, concerned the sales are masking capital outflows. The crackdown extended to foreign insurers in Hong Kong and was blamed for Hong Kong-listed insurer AIA Group tumbling as much as 7.2 percent on Oct. 31.